Simplified grain marketing. Professional pricing. 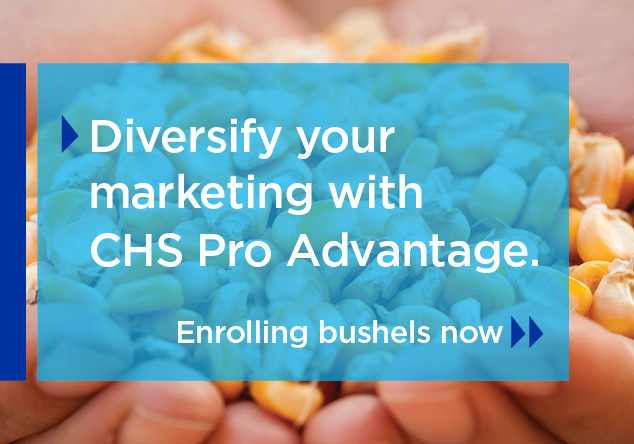 A CHS Pro Advantage contract provides a simple, seamless way to diversify your crop marketing while benefiting from professional pricing. It’s especially important to allow trading experts to price for you during times of volatile or low-priced commodity markets. Our team has a track record of success-we outperformed the competition’s corn prices by 1.7 percent and surpassed soybean prices by 10.5 percent. 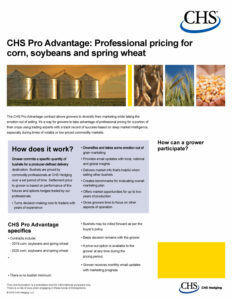 CHS Pro Advantage allows a grower of corn, soybeans or wheat to pledge a specific quantity of bushels for a grower-defined delivery destination. These bushels would be priced by the commodity professionals at CHS Hedging/Russell Consulting Group over a specific period of time. The settlement price to the grower will be based on the performance of the futures and options hedges traded by our commodity professionals. Basis decision remains with the grower. Cost to the grower is $0.10 per bushel enrolled for the 2019 program and $0.12 for the 2020 program. There is no minimum for bushels. Bushels may be rolled forward as per the buyer’s policy. A price-out option is available to the grower at any time during the pricing period. Grower receives monthly e-mail updates with marketing progress.